There's not much written about Carleton Watkins' visits to the Northwest. We have several prints from his 1883 visit, and they may be the only existing instances of those images. Two of them are dated December 1, 1883, but even though the label appears to be contemporary with the visit, I wasn't 100% sure. 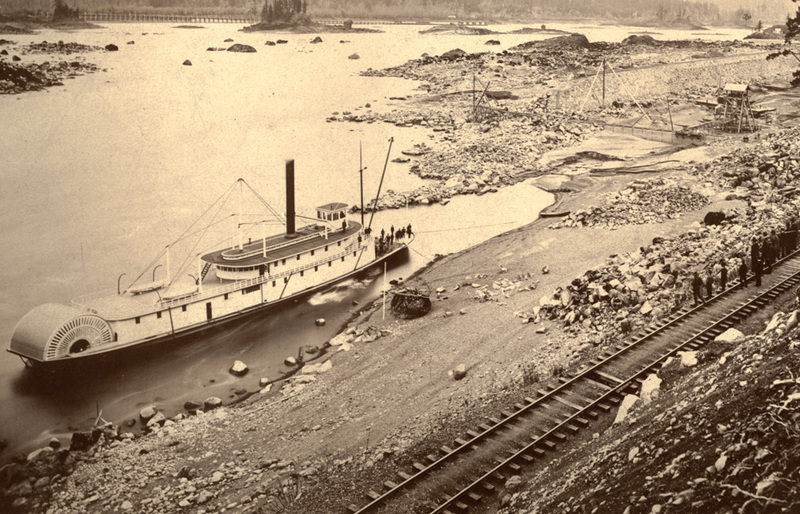 The date is important to me because the oldest "dateable" image of Hood River in our collection dates to this visit, and I wanted some independent corroboration he did indeed come through here in December 1883. Last week an HHR viewer alerted us to the online diaries of Brigham Young's son Willard. Since Willard Young worked at the locks in 1883, I wondered if he actually met Watkins. Sure enough, his diaries describe a photographer visiting the locks engineering office on December 1 seeking information, and he mentions watching the photographer taking photos of a steamer on December 2. While there is a slight date discrepancy here (Watkins might have taken photos of the steamer on both days, or one of them may be off by a day) this is close enough to proof for me! It is rare in history to meet the journalistic standard of multiple independent sources on a minor event 150 years ago. When it does happen, it is very satisfying. Is there a name for the boat? Does the single stack indicate a single engine? I have some unusual photos of Koberg's Beach from the 30s I've digitized, if you're interested. They're from the collection of a lady who spent her early childhood there. Kenn, there is no sign of a name on the stern. There is no name on the side of the wheelhouse either. Perhaps its name is on the front of the wheelhouse? It doesn't look like any of the sternwheelers I am familiar with. The water is so low, I am surprised the boat could get this close to Cascade (not yet) Locks. Thank you to people who kept diaries. Interesting discussion of the dating challenge, Arthur. So what are we looking at? There's a lot going on in this picture. It looks as though they are starting to build a canal or locks around the rapids; who was constructing it? And is that the trestle for the portage railway on the other side that we're seeing? You should consider giving a talk on Carleton Watkins one of these days and what we can learn from his photographs. These riverboats were designed with very shallow draft so they could stick their bow up at any beach along the river to accept freight or passengers. We've been spoiled by dredged channels and accurate navigation maps. I'll bet they had a deckhand sampling depth with a line the whole way in. Any idea what the second stack is for? White with 4 guy wires. I think the white vertical spars on the ship are structural. They allow the engineers to create a more rigid structure. Without it I think the ship would be more likely to snap in the middle under certain forces. The Army Corps of Engineers started construction of these locks about 1878. They weren't completed until 1896. 1883 was a key year, as this was when the railroad started service through the Gorge. Steamships had held a monopoly on freight transport, but now rail was available, allowing freight to travel faster and with less handling. I think that is the old portage railroad on the far side. It starts at a river level loading area, and rises up to the shoreline. There are several cars on the track in this photo. Great sleuthing, Arthur! Part of the fun and challenge of museum work is the detective work investigating individual objects: it can be very satisfying and enlightening (or lead no where! ).